Launched in the spring of 2009, the City of Montreal introduced BIXI as the city's public bike system. Simply put, you pick up a bike from one station, travel to your destination and return the bike to another station in the network. The system now has 400 stations and 5,000 bikes throughout Montreal. It's available three seasons a year from May to November (winter is excluded for obvious reasons), 24 hours a day for seven days a week. Fees range from $5/24 hours to $28/30 days to $78 a year. The technology and design of the BIXI system was by Quebecers, including the manufacture of the majority of parts and the final assembly in La Belle Province. The bikes were adapted to withstand Canada's harsh climate conditions. The BIXI movement is extending south of the 49th Parallel, too. 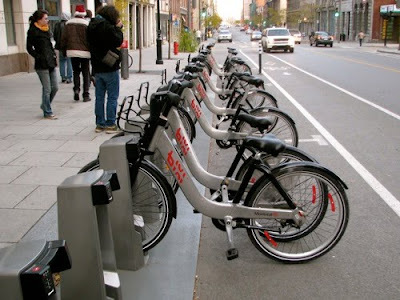 Washington, DC and Arlington, Virginia are adopting the public bike system in the fall of 2010. There will be 1,100 new BIXI bikes at 114 stations along the Arlington-Washington corridor. Washington State University in Pullman, Washington is also joining BIXI, making 30 bikes available for its students. BIXI has been honored with numerous awards: Gold at the Canadian Public Sector Leadership Awards and the Institute of Public Administration of Canada; Time magazine's Best Inventions of 2008; and a Gold Edison New Products Award for Energy and Sustainable Development.